Born 1948 in London, lives in London. Degrees: Cambridge University (biochemistry, 1969), Edinburgh University (genetics, 1971), Institut für Sonologie, Den Haag (1976). 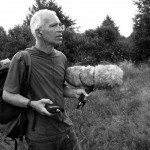 Peter Cusack is a sound artist and (improvising) musician, and is also active as a field recording artist (e.g. Baikal Ice, CD 2003) and a teacher. He is a Senior Lecturer at the London College of Communication and teaches and conducts research at other institutions, including the University of the Arts, London. In his capacity as a musician, he co-founded and directed the London Musicians’ Collective and was a member of the group Alterations (with Steve Beresford, David Toop and Terry Day). The focus of his current work – which he presents in appearances and performances, radio and CD productions, lectures, exhibitions and installations – is our man-made sound environment; the works’ categorical context is shaped by the conceptual approach of acoustic ecology. Peter Cusack is the artistic director of Berlin Sonic Places.